Alesana Tuilagi is a Samoan international who plays for Leicester Tigers and, because of his awesome mix of pace and power, is regarded as one of the most dangerous backs in the Aviva Premiership. 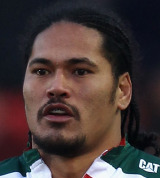 Tuilagi joined Leicester in 2004 after a spell in Italy with Rugby Parma and made his Tigers debut against Leeds in September 2004. The powerfully-built winger established himself as a focal point of Leicester's attack in the second half of the 2006/2007 season, scoring eight tries in eight league starts, including a brace during a man of the match-winning display against Gloucester in the Premiership final. Tuilagi has been a mainstay of the Tigers back-line ever since and has already broken through the 150-point mark as a Leicester player. He made his international debut for Samoa in a 2003 World Cup qualifier against Fiji in June 2002, and went on to play in the 2007 World Cup, alongside his brothers Henry and Anitilea, and has also represented the Pacific Islanders team. His greatest moment in international rugby, though, came in July 2011 when he scored the opening try in his side's sensational 32-23 victory over Australia in Sydney.